The Caledonian Foresters is a group of people with the common purpose of conserving the remnants of the ancient Caledonian Forest that once covered most of the Highlands, encouraging them to continue to expand by natural regeneration. They wish a respect for nature, allowing natural processes to continue as they have done for 8,000 years since the last ice age. They reject those who in recent decades have diminished and damaged Caledonian Pinewoods by intervention planting, cultivating, fertilizing, fencing and using large timber machines. The Old Caledonian Forest once covered an area of the order of 1.5 million hectares across the Scottish Highlands. Although genetically distinct, it formed part of the vast Boreal forest that covered the high northern latitudes around the globe. It is a distinct ecosystem that most people now agree needs to be preserved. However, like all ecosystems, protecting and preserving it is more complicated that you might imagine at first. 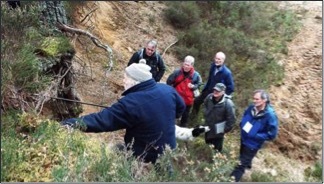 On 6th March, some members of the group met at Dinnet for a field trip led by Adam Watson, looking at soil profiles in two local pinewoods and a nearby piece of heather moorland. I have reported the outcome here (and tried to keep the concepts simple!). The first site was in a pinewood at Loch Davan, where the pines are about 100-150 years old. Within the wood there is a sand/gravel quarry, where it is easy to study the soil profile. The soils here are excessively freely-drained as the silt and clay fractions were washed out by glacial rivers in the past. Due to these freely-draining soils and low rainfall, the site has never been cultivated, and a classic iron podzol soil-type has developed. This is typical of soils in the boreal forest from around the globe. It leads on a nearby ridge to a rich show of lichen-dominated pinewood floor vegetation, a characteristic part of the boreal forest ecosystem. Podzol soils are characterized by acid leaching of nutrients and minerals from the upper layers into the lower layers. They show distinct colour banding. Because they are poor in surface nutrients, they do not form fertile soils for agriculture, even when ploughed. The second site was a similar age planted pinewood on flat freely-drained ground beside a disused sawmill close to Dinnet village. Long before the pines were planted, the site was cultivated by pre-historic farmers, and this cultivated soil remains. However, owing to re-podzolisation from pine litter, a thin surface podzol now lies above the cultivated soil, burying it. Two years ago, large machines were used to cut and remove pines along linear racks. These machines formed large deep ruts. Examination of the soil profile at the ruts showed inversion of the principal soil layers, far more disturbance of the profile than caused by pre-historic farming. This inversion of the layers, leading to less acidic soils at the surface, alters the ecosystem and favours different understory vegetation such as grass and bracken. These plants can effectively prevent the pine seedlings from germinating and hence inhibit natural regeneration. The third site was at a section of heather moorland on the Muir of Dinnet, kept open by burning and cutting. Here the soils show almost no podzolisation, due to the effect of the less acidic heather litter as opposed to pine litter. 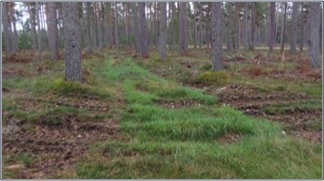 Around the specific site, there is good evidence of natural recolonisation of silver birch and Scots pine; the heather leaves sufficient bare soil for the tree seedlings to germinate. In this case, the area would eventually return to a forest ecosystem if left alone. The conclusion is that heavy timber machinery can cause large-scale soil disturbance, which inhibits natural regeneration of Scots pine. This conclusion has been substantiated by fieldwork at scores of pinewoods since the mid 1990s. In the next edition of Mountain Views, Adam Watson describes such soils and such damage in greater detail.